Mr. Mallard: So, in general you are waiting for a not guilty verdict in this interrogation? President Assad: We are certain of our innocence. There is no evidence that Syria is involved. There is no criminal evidence; and Syria has no interest in that crime, nor does it have a history of similar actions. On the contrary, we have an interest in seeing the investigation uncover the truth, because this truth, as far as we are concerned, is the complete innocence of Syria. We have no doubt about this, and that is why we talk about the necessity of having a just and professional investigation. Mr. Mallard: But what do you feel today? Do you feel there will be a confrontation between Syria, on the one hand, and the United Nations and international community on the other? Or do you think there is a place for a certain kind of a compromise at present? In your view, is such a compromise possible? President Assad: If you go back to the history of the Syrian-UN relations, you will see it as continuous cooperation. We support UN resolutions and believe that the entire world has an interest in a stable and active United Nations. When we talk of a compromise, it means there is a difference over something and we have to find a middle way. If we go back to the UN Charter and conventions, we find that Syria has an interest in the implementation of these conventions and the implementation of international law in general. But the problem now is that this UN, and the Security Council in particular, has become an instrument implementing the will of a few politicians in the world when they disagree with a certain state. Worse than that, they do not necessarily use the Security Council in the best interest of their countries. I believe they use it against the interests of their countries and against our interests. Therefore, to avoid saying “compromise”, the solution is very clear: it is recourse to the UN Charter. If we apply the Charter, Syria will benefit directly and there will be no need for a compromise. The solution is very simple. Mr. Mallard: When you talk about the United Nations, do you mean it is controlled by the United States at the moment? President Assad: No, not only the United States. You know there are five major states which have more powers than all the other member states. Sometimes certain deals take place among the big powers, and the United States has an essential role in this issue. Yet the other four powers can also strike a balance against this or that role or against political mistakes that want to use the Security Council for special purposes, but this is not happening today. Mr. Mallard: In any cases, can we say that your Excellency, Maher al-Assad, and your brother-in-law, are targeted by commissioner Mehlis? Can we say that? President Assad: In fact, there are no indications in this direction; but we always say that the issue is not an issue of names. The issue is rather the legal grounds for the work of the Investigation Commission? What does it base its work on? What are the controls? In any investigation happening in any judicial system in the world, if you bring a good judge to work in a bad judicial system, the result will not be good. This is the problem, not the names. We, in Syria, have never talked about the names with any party. Mr. Mallard: Mr. President, you are stressing that you are a victim of an international plot concocted by the United States and some of its allies. Are you hinting that France and President Jacques Chirac have a grudge against you? President Assad: I want to talk about facts in order not to talk in general headlines. Resolution 1559, passed in September 2004, refers to things, Lebanese domestic issues, and Syrian-Lebanese issues that are related to the common relations, and to be more precise, to the Syrian military presence in Lebanon at that time. This resolution was passed without a request from Syria or from Lebanon. Resolution 1636, which is related to the investigation, was passed on the basis of a report, which the Commission says, is incomplete. It threatens Syria of sanctions in accordance with Chapter 7 of the UN Charter, which is only used when there is a threat to international security. France and the United States took part in passing both resolutions. If we do not call this a plot or a conspiracy, do we call it an act of charity for instance? Anyhow, the name does not matter. These are facts regardless of the name. At least there is a French participation in resolutions of the kind that do not serve stability in the region. Mr. Mallard: When President Chirac says, and I am here quoting him literally, “If the Syrian President insisted on not listening and on misunderstanding what is happening, then we have to move to the sanctions stage.” How do you react to this? President Assad: As you can see, we have not reacted before to this, and I am not going to react to it now for reasons related to manners, and at the same time because of my concern for Syrian-French relations. But there are a few points I can make now. When a President listens, he listens to his people first of all before he listens to others. Then he listens to his loyal friends and political partners. Second, we might not be able to understand many things; but we cannot understand how France put all its weight behind the investigation into the assassination of Prime Minister Hariri. Of course we understand and support the investigation, but at the same time we have not said a single word about the assassination of President Arafat who was assassinated on the Palestinian territories and died in a French hospital. Arafat’s death passed by without us knowing anything about it. Why these double standards? Double standards are not characteristic of French policies. This is one thing we do not know and do not understand. Are we going to get an answer any time soon? Mr. Mallard: You are hinting at the poisoning of President Arafat, but the French are not the ones who killed Yasir Arafat. President Assad: Of course they did not. And they did not kill Hariri either. But Prime Minister Hariri died on Lebanese territories, while President Arafat died on French territories. Second, President Arafat is higher in status and richer in history than Hariri, with all due respect to Prime Minister Hariri. It was only normal to see France moving in that direction for moral reasons, and because justice is part of the French constitution. Mr. Mallard: Since the assassination of Prime Minister Hariri, who was a close friend to President Chirac, we have the impression that your relations with President Chirac are governed by hatred. What, in your view, can bring back the Syrian-French relations and your personal relations with President Chirac to their past course? President Assad: First, I do not hate President Chirac. On the contrary, I used to have the highest regard for this man in the past for many reasons. But I want here to separate this relationship from the Syrian-French relations. The two are not the same, and during the past period, it did not change a lot. May be it was affected for this and other reasons that have to do with the French role that has receded in the Middle East, and has become sometimes absent. What can bring back this relationship or push it forward is, as I always say, an institutional relationship that is based on the institutions and not on individuals. The Syrian-French relations should be direct and not via a third party, and this is something unavailable now. Mr. Mallard: Can we say, or are you saying that President Chirac and yourself have to decide to begin a dialogue and put all the problems on the table? President Assad: For a year and a half, or perhaps for two years, we have tried to do so because it is very important, but we got no response. Until now we do not know what are the real reasons that led President Chirac to change his position, and every time we receive general and unconvincing answers. So, we are waiting for a clear answer. Nevertheless, the relationship and the dialogue among institutions contributes to understanding the reasons. This is what we are working for today. Mr. Mallard: If you have a message to the French people, not to President Chirac, what would that message you personally want to send to the French people be? President Assad: The French people have a great history, distinguished from the histories of other peoples, even in Europe itself. This has given the French people a special culture, an open culture, which has reflected on French politics and gave an important role to France in Europe, in the world at large, and in the Middle East in particular. President Charles De Gaulle also added a great deal to this French position. This role is in fact receding today, as I said a short while ago, and seems sometimes invisible, sometimes inexistent, and sometimes subordinate to other roles. This has never happened in the history of the French role before, and could have many political causes, and may be other causes that need to be examined. But the net result is that this harms the interests of the French people first of all, the interests of Europe and the world, and our interests in the Middle East. We cannot actually separate the interests of Europe now from the Middle East, and the evidence is what happened in the past: 9/11 in New York, the Madrid explosions, the London explosions, what is happening in Indonesia, and what is happening in the Palestinian territories. So, the French people have to move again through their institutions in order t restore this French role which is characterized by openness towards all cultures, and should reject the attempts aiming at isolating this French culture which remained unisolated for over two hundred years, i.e since the French Revolution. Mr. Mallard: Syria and France have always been close in terms of their geographical position in the Middle East. Would you accept an invitation from President Chirac to Paris? Or do you want to see him here to conduct a dialogue and talk about all issues? President Assad: As I said, the issue is not subject to personal relations or to a certain mood. It is our duty to look after the common interests of our two countries. It is our duty to conduct visits on the Presidential level and on different official levels. If we do not do this, then we would not be doing what is right for the relationship between these two peoples. We do not have any objection to anything that could improve relations, because France is an important country, and there is an emotional historical relationship connecting Syria and France. And no one, at least in our country, feels comfortable for the deterioration of this relationship. Therefore, we support anything that serves this relationship; and we do not even have any conditions in this regard. Mr. Mallard: On another topic, what are you going to do practically in response to the United States and George Bush who says that you are not controlling the borders with Iraq? President Assad: First, they say that they cannot control their borders with Mexico, so how could we control our borders with Iraq? Therefore, the issue of controlling the borders completely and absolutely is only theoretical and practically impossible. Nevertheless, Syria is controlling the borders to a great extent. I shall give an example illustrated by figures: They say that they estimate the number of terrorists in Iraq at about 1,000 to 3,000. And they know that Syria stopped in the past two years about 1,600, which is 52% of their estimates. Anyway, everything said in this regard is a case of escaping forward, or is like the ostrich which buries its head in the sand in order not to sea the truth. The main danger or error which leads to terrorism in Iraq is, first of all, the wrong war. Second, it is the wrong political performance in managing the affairs of Iraq by the occupation powers. This accusation to Syria aims simply at blaming somebody else so that they do not take responsibility. Mr. Mallard: Mr. President, in a world where Islamic extremism is getting more powerful, do the “Muslim Brothers” pose a threat to Syria as they do to Egypt? And is that the reason which made some of your neighbours, like Saudi Arabia and Egypt, intervene with President Bush demanding that he should not harm Syria’s stability and security? 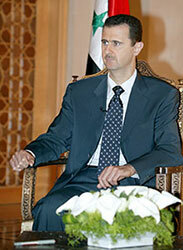 President Assad: There are “Muslim Brothers” in more than one Arab country; and in every country they have leaders. We have relations with some of them. Our problem, or the threat to Syria, is only part of these people, those who believe in violence and those who carried out terrorist acts in Syria in the 1970s and 1980s and killed thousands of Syrians. The problem is not in the name, it is in the kind of thought which controls these groups, i.e. extremism. Whether this extremism was Islamic, Christian, Jewish, or whether it was social or political, all extremism leads to destruction. But the causes of this extremism lie, first of all, in the international chaos which exists in the world, the big mistakes made by the big powers and which escalate the terrorism based on this extremism. Consequently, we are worried. Are Egypt and Saudi Arabia worried? We are all worried. If you go now to any Arab country, you will hear the same thing, and expression of the same concern. Hence, there should be a solution which addresses the causes in order to overcome this concern. Mr. Mallard: After all that has happened between Syria and Lebanon, is there, Mr. President, a future for a good and quiet relationship between Syria and Lebanon? And is there, if I might ask, an opportunity for peace in the Middle East and the Arab world, between you and Israel? President Assad: Concerning our relationship with Lebanon, of course it will naturally go back to its former condition. This requires a number of conditions which, now, do not exist completely, but partially. But we and Lebanon are convinced of the importance of this relationship, because it is deeply rooted in history; and we cannot change this history. As to the question of peace, we, I mean the Arab countries, made an initiative in 2002, at the Arab summit in Beirut, calling Israel for peace. But peace needs a number of factors. The first factor is people’s desire for peace. As far as the Arab peoples are concerned, their position towards peace has not changed despite these bad conditions that you can see in the Middle East, and may be in most parts of the world. We believe that the Israeli people have drifted, somehow, away from peace, may be because of their leadership, or because of their internal politics. The American administration, which is a main sponsor of the peace process, is not at all interested in the peace process. We actually heard this from them, from the American officials on more than one occasion. The European role, which is an important role, has to change. Europe cannot play the role of a marketing agency for the American role towards the peace process. There should be an independent European role, but in harmony with the American role. It should not contradict the American role, it should be in harmony with it. This needs a European American dialogue which does not exist now. That is why we do not envisage a peace process in the near future. We have to be realistic. Every day this process is delayed, there will be more blood. And more blood means more barriers, and consequently a higher price. It is better to move quickly in this direction. Mr. Mallard: A last word, Mr. President, when we are convinced that Iran will possess nuclear weapons, do you fear a confrontation between your Iranian ally, on the one hand, and the United States and Israel, on the other? Is there a danger of such a confrontation? President Assad: Danger is always there. The political statements we hear and the political performance we see, particularly after the war on Iraq, make us start to feel many dangers, not only one. But in order for analysts not to waste their time analyzing this issue, I would say if this confrontation were to happen, it would be the point of no return, and will destroy the entire Middle East. Its repercussions will extend to Europe and many distant regions of the world. And restoring peace would then need decades and may be centuries, God knows. No one can say. This is a very dangerous issue. France, and other countries of the world, should do their best in order to prevent such a confrontation. Mr. Mallard: Thank you very much, Mr. President, for giving us this interview, and please accept our best wishes.